Greek Christening invitations with castle and little stars for a baby girl coming in a board with a castle pattern in yellow and orange colour and little stars with gold glitter details. The matching envelopes are square white rice paper and your personalised wording is printed in plain black colour. Size: 16 x 16 cm. 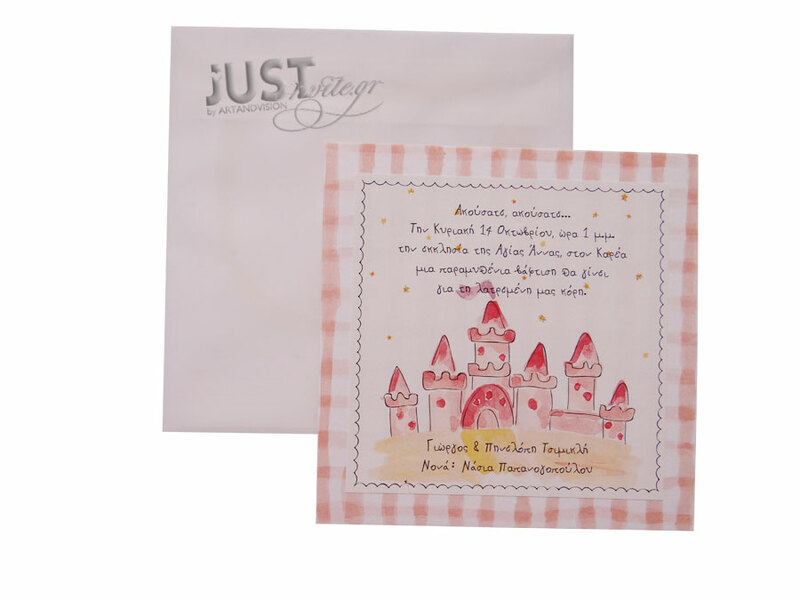 https://www.preciousandpretty.com/2017/04/invitations-for-orthodox-baptism-with-little-stars-C905.html Greek Wedding Favors|Orthodox Crowns|Stefana|Baptism Invitations Invitations for Orthodox Baptism with castle and little stars C905 Orthodox Baptism invitations with castle and little stars for baby girl Product #: Greek Wedding Favors|Orthodox Crowns|Stefana|Baptism Invitations_3065581252361628009 5 stars out of 5 reviews.